Thrill-seekers looking to take their fear of heights to a new level can come to downtown Los Angeles this summer. There, they can careen down a clear glass slide atop the tallest building west of the Mississippi. Nothing but inch-and-a-quarter glass separates riders from the ground. The ride promises to provide both a thrill and quite the view for anyone willing to open their eyes along the way. On a clear day, the 72-story tower provides panoramic views. They can extend to Catalina Island 22 miles off the Pacific Coast and over the Santa Monica Mountains to the city's sprawling San Fernando Valley. "There will be nothing like it in the U.S.," said Lucy Rumantir. She is head of U.S. operations for the building owner OUE Limited of Singapore. Skyslide also continues a trend of creating attractions designed for urban thrill-seekers. For some reason, they seem eager to laugh in the face of acrophobia. Grand Canyon Skywalk, the horseshoe-shaped bridge that opened nine years ago, allows visitors to stroll right off the edge of the canyon's north rim. They can stare through 2,000 feet of nothingness to the canyon floor. The Las Vegas Strip's X-Scream roller-coaster sends riders on a wild plunge off the top of the 1,100-foot Stratosphere Hotel and Casino. Chicago's Willis Tower (formerly the Sears Tower) renovated its 103rd floor observation deck in 2009. It added all-glass balconies, allowing people to actually step several feet off the ledge. 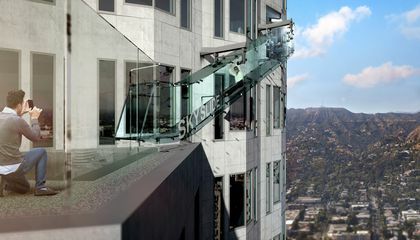 In Los Angeles, Skyslide is part of a $50 million renovation. It will also put an open-air observation deck and bar on the tower's top floors. I personally think that the making of this slide is a great way to attract tourists and people to adventure into the downtown area! The ride will be "relatively brief" because even though it (the slide) starts from the 70th floor it does not end at the 1st floor, it ends however, at the 69th floor. 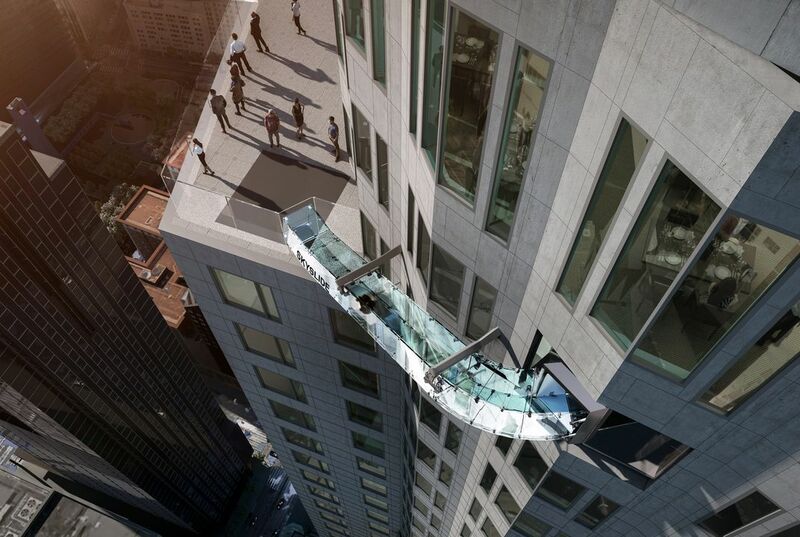 According to the article the slide "will span 45 feet from the 70th to the 69th floor of the U.S. Bank Tower." I liked this article a lot, and thought it was quite informing. I hope to slide on it this summer. I think it will be a huge tourist attraction, that many people will come to from all around the world. I also hope that the slide does not break. The ride will be brief because the slide only goes from the "70th to the 69th floor of the U.S. Bank Tower." It is also only 45 feet long. I found this article interesting because I want to ride on the slide. The ride will be relatively brief because it is going to go fast. Also, it is only 1,000 feet. I know that seems as a lot, but when the ride is going really fast, it won't feel like a lot. The ride will go basically as fast a roller coaster, which is why it will give a lot of thrill and a great view. I think the ride will be " relatively brief" because of its condition. The ride cannot be very long because of how it is built.One it is very close to ground and the cost to build a very large slide made of glass would be very expensive. And they added extra necessities such as a observation deck and many other thing. The ride will be relatively brief because its 70 stories in the air and it is dangerous just to be on it in the first place. In paragraph 2 it talks about how the slide will be going from the 70th floor to the 69th floor. In the last paragraph it says that the people who work there are going to try it first because they have to make sure it is safe for the public. so if you want a scary and dangerous ride go to LA and go on the slide. The ride will be relatively brief because it is really high up in the air. So it would be scary to some people. It has to be a creative thing because it is in LA. It has to be thrilling. I think the ride will be brief because they will need to take in all of the safety reasons for ride like the Chicago Skyline. The ride will be "relatively brief" because the slide won't be quite long. This slide will just pass down from the 70th to the 69th floor with a span of 45 ft. This slide is just to give a brief view of the city. The article says The "Skyslide" is scheduled to begin sending urban adventurers down the relatively brief ride 1,000 feet above the ground in June. It will span 45 feet from the 70th to the 69th floor of the U.S. Bank Tower." The ride will be "relatively brief" because it is only from the 70th floor to the 69th floor. The slide is also only 45 feet long." It will span 45 feet from the 70th to the 69th floor of the U.S. Bank Tower. ".Even though the title is the 70 story slide it does not go from the 70th story to the 1st floor it indeed goes from the 70th to the 69th floor.